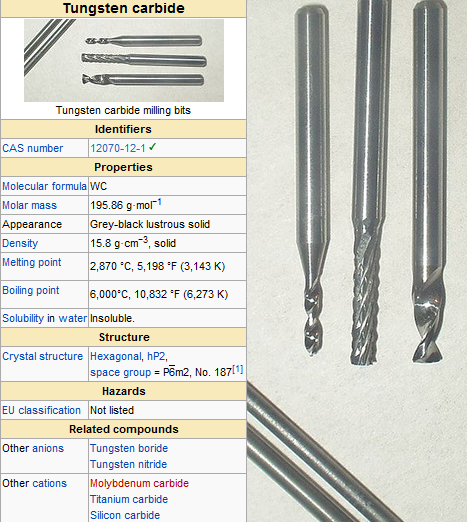 Tungsten carbide (WC) is an inorganic chemical compound (specifically, a carbide) containing equal parts of tungsten and carbon atoms. Colloquially, tungsten carbide is often simply called carbide. In its most basic form, it is a fine gray powder, but it can be pressed and formed into shapes for use in industrial machinery, tools, abrasives, as well as jewelry. Tungsten carbide is approximately three times stiffer than steel, with a Young’s modulus of approximately 550 GPa, and is much denser than steel or titanium. It is comparable with corundum (α-Al2O3) or sapphire in hardness and can only be polished and finished with abrasives of superior hardness such as cubic boron nitride and diamond amongst others, in the form of powder, wheels, and compounds.